In addition to discipline-specific reference works, scholarly authors frequently need to cite more general authorities such as English-language dictionaries. This type of work has its own citation rules, which this post will address. 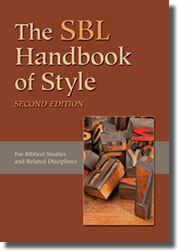 First, however, we wish to reiterate which dictionary SBL Press prefers and how it is to be used. As indicated in the SBLHS section on spelling, “For words other than proper nouns, Merriam-Webster’s Collegiate Dictionary is the preferred authority” (§4.3.2.1; the latest edition of Merriam-Webster’s is the 11th). In other words, SBL Press publications should conform to the spelling conventions used in Merriam-Webster’s Collegiate Dictionary. SBLHS further clarifies that, “where multiple spellings are listed, use the first.” Finally, Merriam-Webster’s is also the authority for knowing when to italicize an originally non-English word and when to format it roman (see SBLHS §4.3.2.5, no. 3). These style preferences pertain only to use of a dictionary for determining the preferred spelling or formatting of a word; any English-language dictionary may be used to document an author’s definition or usage of a term. The rest of the post will address how dictionaries used in this latter way should be cited in a traditional (footnote; not author-date) citation system. 1. A citation of an English-language dictionary should be placed within a footnote, not embedded within the main text. 2. A citation of an English-language dictionary will generally include the title of the work, the edition, if not the first, the abbreviation s.v. (sub verbo: “under the word”), and the word as listed in the dictionary, enclosed in quotation marks (see further CMS §14.247). Note especially that a comma is used before s.v. but not after it. 3. Frequent citation of a standard dictionary justifies the use of an abbreviation for the work, provided, of course, that the full title and edition are specified in an abbreviations list. These few principles suffice for English-language dictionaries. In addition, following CMS §14.247, standard encyclopedias or other general works such as Encyclopaedia Britannica or the Dictionary of American Biography may be cited in the same fashion.